With so many blog posts about technical jargon and product information I thought that we would put all of that aside and give readers a brief journey through the Story of Ink Hub from it's humble beginnings to now. My name is Dean and I am the owner/manager of Ink Hub. My background was mainly focused around the Electronics Industry. After leaving High School I spent 2 years at Regency Park Tafe training to be an Electronic Serviceman. During this time I was into Ham Radio, CB's and all sorts of nerdy electronic stuff. I worked in the electronics industry for quite a few years including making prototypes for local and overseas military equipment. Several years down the track I had a complete career change and worked at the "Riverside Golf Course" and also the "Grange Golf Course" as a greenkeeper. While working at the grange an opportunity came up at the "Enfield Cemetery" and being just around the corner from where I was living I took the position. During the next few years I got married, bought a house and ended up moving out Salisbury way. Around about 2005 I was given my first computer by a very good friend of mine and this is where my interest in web design and the internet began. I needed a printer to go with my new computer so I ended up purchasing a Brother DCP 110 at our local Big W for around $100. Here's where the Ink Hub story comes into play. The kids soon used up the ink in our new printer so I headed to the shop to grab some more. I came home empty handed as there was no way I was going to pay over $100 just for the ink. After searching on the internet for several hours I finally tracked down a cheaper source of ink, purchased it for a song and wow it worked perfectly. The old cogs started moving and the idea of reselling these generic inks seemed like a great idea. I found the wholesaler for these generic inks, bought a heap of them and headed off to my local market to make a killing. The wife looked at me with the look of "Here he goes again" and she was right. Home I come after 3 or so hours without selling a single ink. I designed the first version of the Ink Hub website based on the Oscommerce platform and went live online in 2007 accepting payments via PayPal, Bank Transfer and Cheque. I continued working at the Enfield Cemetery and after several weeks I thought I'd check the website and Blow Me Down people had actually started placing orders. We rushed down to the local Post Office, purchased some Express Bags and sent the inks on their way. From this time on it simply got busier and busier until later in 2008 It become so busy that it became a full time business. It's been a huge learning curve and I've learnt so much about SEO, Web Design, Web Hosting and PHP etc. 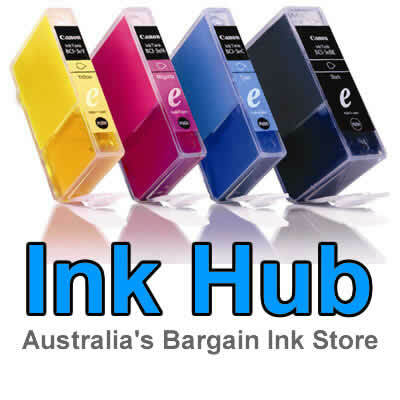 Nowadays Ink Hub is supplying 1000's of customers throughout Australia including schools, Large Corporations, Home Business and Home Users. Our Generic Inks have become incredibly popular and we now import all of our cartridges direct with no middle man. If you are interested in starting an online business I thoroughly recommend that you host it in Australia with a reputable webhost as it can be a huge nightmare with the cheaper overseas companies and the extra money for the Aussie server is money well spent. So now in 2014 Ink Hub remains a family business servicing around 17,000 customers throughout Australia and continues to grow steadily. Our aim has never changed and our philosophy is simply to provide the very best quality cartridges, low prices, fast delivery times and fantastic customer service.